Hanging weight refers to the weight of the carcass when it is placed in the cooler to be aged by the butcher. After it is aged, and broken down, the amount of meat you take home will be less (about 37% less for our cattle). Our cattle tend to be around 450-500 lbs. hanging weight, so that's somewhere between 166 to 185 lbs. for your freezer. Contact us to let us know your interest. The Piney Woods breed was brought to the Gulf Coast 500 years ago from Spain. 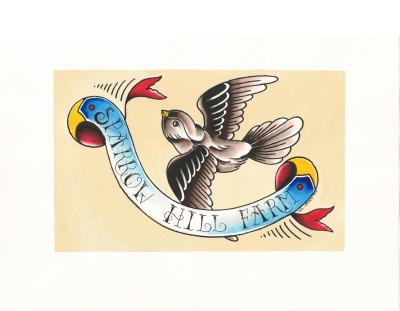 They were used for logging, meat and dairy by the homesteaders in the region. 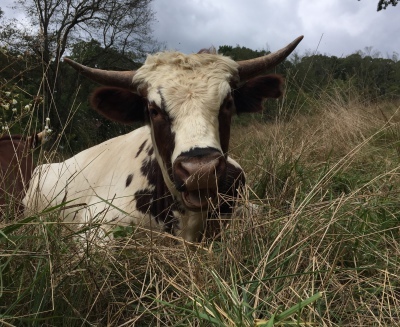 While they fell out of fashion with the growth of other continental breeds in the U.S., they are interesting to us because they are very well adapted to the heat and humidity of the south east, and they can thrive on broad on a diversity of forage. 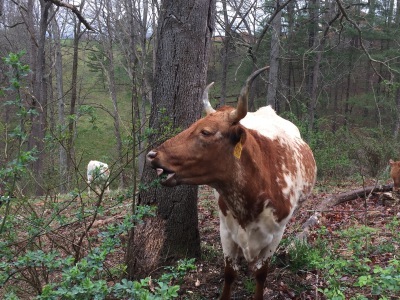 We have watched them assist in the restoration of old pasture by munching on encroaching brush and weeds. We have also seen them be fantastic mothers. 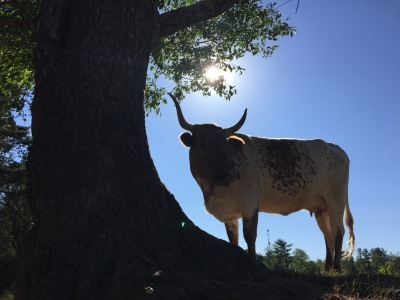 Piney Woods cattle are currently listed as “threatened” by the American Livestock Conservancy and our hope is that by continuing to raise this special heritage breed, we can help efforts to conserve their genetic strengths for our region. 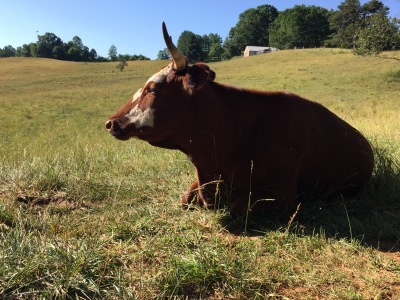 Read more about the history of Piney Woods Cattle here. Here is one of our cows munching on multi-flora rose! Our cattle have done a great job keeping weeds and invasives in our fields in check. This is Francis, our bull. He is mild natured, handsome and has sired some great offspring.